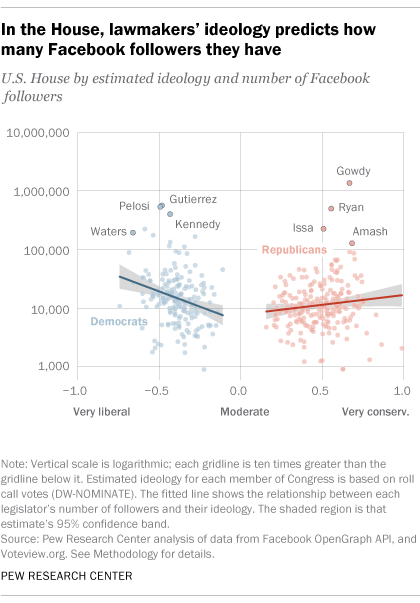 The most liberal and conservative members of the 115th Congress have attracted more Facebook followers than moderates, according to a new Pew Research Center analysis. The most ideological lawmakers in this analysis are defined as the 10% whose scores are farthest from zero, whether liberal or conservative, while the most moderate members are defined as those in the 10% closest to zero, again regardless of political leaning. The analysis only evaluates the number of followers for members’ official profile pages; it does not examine the number of followers for members’ campaign or unofficial Facebook pages, nor does it evaluate their Facebook posts. Following a member’s page translates into more exposure to that lawmaker’s messaging, as it increases the likelihood that the content shared by that member appears in a user’s Facebook feed. Republican Rep. Trey Gowdy of South Carolina, who chaired the high-profile Select Committee on Benghazi, had more Facebook followers than any other House member, with slightly over 1.3 million. Next were Illinois Democrat Luis Gutierrez, Democratic Minority Leader Nancy Pelosi of California and GOP Speaker Paul Ryan of Wisconsin, with between 500,000 and 600,000 each. In the Senate, the overall pattern of ideology predicting Facebook followers is largely driven by a small number of prominent members in both parties, including Democrat Bernie Sanders of Vermont, Texas Republican Ted Cruz, Massachusetts Democrat Elizabeth Warren, Kentucky Republican Rand Paul, Utah Republican Mike Lee and Minnesota Democrat Al Franken. Sanders, Cruz and Paul all ran for president in 2016. Arizona Republican John McCain, who had more than 1 million followers, ran for president in 2008. 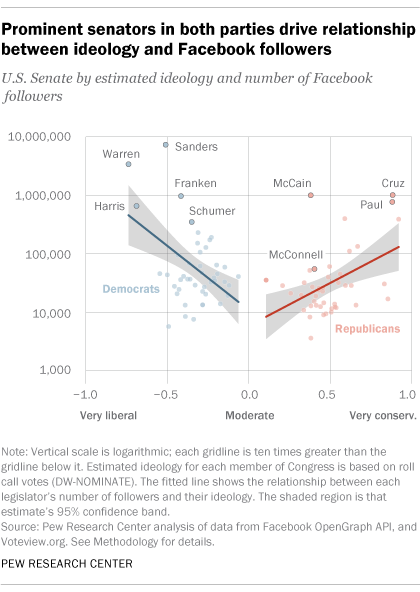 It’s not clear exactly why more-ideological members have more page followers than moderates. But a February Pew Research Center analysis of Facebook posts shared by members of the previous Congress found that very liberal or conservative lawmakers were more likely to share content that expressed indignation or disagreement on political matters, and that such posts drew more engagement online. Other research that examined past Congresses using the same measure of ideology has found that media outlets were more likely to cover the most liberal and conservative members of the U.S. House than they were moderates. In the new analysis, party leaders and past presidential candidates were especially likely to draw a large number of Facebook followers. The median number of followers for the current minority and majority leaders across both chambers was 424,950. The median past presidential candidate – including candidates in the 2008, 2012 or 2016 elections – had 1,000,073 page followers. By contrast, the average member of the House and Senate had a much smaller online audience, with a median of 12,106 and 31,255 followers, respectively. Looking at Congress as a whole, more Facebook users follow congressional Democrats’ official pages than Republicans’ pages. The median number of followers for Democratic members of the 115th Congress in the House was 14,676, compared with 10,597 for Republicans. Among senators, the median number of followers for Democrats was 39,890, compared with 24,870 for Republicans. This partisan gap may be explained by differences in who uses Facebook to follow politics. A Pew Research Center survey in 2016, for example, found that a higher portion of Facebook users who self-identify as liberal Democrats reported learning about the presidential election through Facebook than conservative Republican users. However, the individual members with the most Facebook followers include lawmakers on both sides of the aisle.